1) there is very little music written for them, so what’s the point? …and then proceeded to debunk both. “John Carmody (Letters, May 31) could add Ann Carr-Boyd's music to the list of Australian composers ignored by the Sydney Symphony. For her 70th birthday celebrations she was commissioned to compose what became her second piano concerto by Ars Musica. Compared to the usual so-called contemporary stuff (composed in a century-old style) the work is rich and full of modern invention. Unfortunately, its modernity means the orchestra cannot realise the sound pallet due to its beloved short keyboard stock of pianos supplied by Steinway's distributor - one of its sponsors. 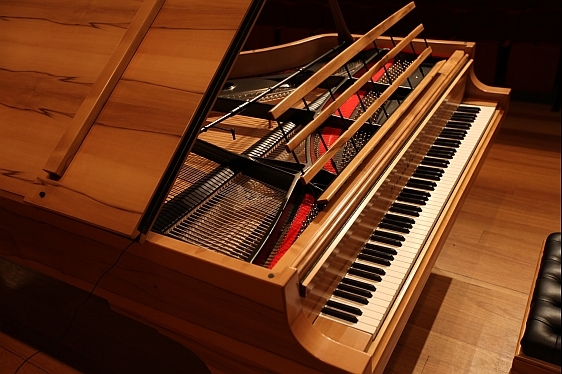 The work was given its premiere by the Wollongong Symphony using a Stuart and Sons piano. I couldn’t agree more. I was privileged to record a concert at the Indepenedent Theatre a week or so ago by the Brazilian pianist Artur Cimirro. Artur is technically quite brilliant, and he used the extra keys on the Stuart piano quite brilliantly at times. Once again, it was a recital quite impossible to achieve with any other piano. The recorded sound is extraordinary. This typifies the inertia and commercial interests inherent in protecting the status quo in music in general and piano music in particular. It is quite heinous that artists of the calibre of Prof. Carr Boyd are restricted in their art in this way. In fact, it could be argued (and I have in the past) that the status quo is stultifying to all musicians, not just pianists. Art needs to develop and expand, and it cannot whilst the Steinway mentality prevails in the way it does. Don’t you just love “short keyboard”? I wasn’t able to record the second concert by the Khachaturian Trio myself, since that was the day I went into hospital for my eye operation and the hospital wanted to keep me in overnight just to make sure things were OK, which they were. So my son David did the honours for me, and did an excellent job into the bargain. So we ended up with quite a bit of material – 65 gigabytes of sound files. What was immediately apparent was the quality and clarity of the sound coming from the two PianoMics. It was almost as though it was a studio recording – which of course is to expected given the proximity of the microphones to the pianos and the minimal ‘bleeding’ of one piano into the second piano microphone. For the two piano works, the stereo split for each PM40 was quite clear, and I was able to mix the two pianos left and right to great effect. What was also apparent was that the two Neumann microphones capturing the stage and ambient sounds were nowhere near as clear. As would be expected, the stereo split was much less apparent, and the clarity of the sound compared to the PM40s was much less. That’s not to say it wasn’t good – for a stage sound it was quite acceptable but compared to the PM40 sound it wasn’t. In fact it turned out in practice that mixing the Neumann and PM40 sounds did not give good results. I suspect there were at least three reasons for this. Firstly, the microphones have vastly different frequency ranges – the Neumanns from 20Hz-20kHz, but the PM40s from 9Hz-40kHz. Secondly, the Neumanns were recording ambient sound which has more reverberation than the close-miked sound of the PM40s. Thirdly, the PM40s capture a very clear stereo split for each piano (this is inherent in their design) which, directionally, is from the back of the stage to the front. The stereo split of the Neumanns, such as it is, is from left to right across the stage. So you have two totally different recording paradigms and sound characteristics from the PM40s and the Neumanns. What I found was that trying to mix the two just didn’t work at all. Mixing the Neumanns into the PM40s destroyed the clarity and positional characteristics of the sound. Mixing the PM40s into the Neumanns resulted in an uncomfortable closeness of the piano sound which was totally at odds with the ambience of the Neumann sound. It was suggested to me that perhaps one could mix a small amount of the PM40s into the ambient sound, and that may well be possible although my attempts to do this didn’t seem in my view to improve matters much. So effectively for the piano works (solo, duet and two pianos) I only used the PM40 sound. For the piano trio works and also some soprano voice performance which was part of the second concert, I only used the Neumann sounds. Not very satisfactory I suppose, but anything else would have seriously compromised the sound and that was something I didn’t want to occur. The solution, I suspect, lies somewhere in the middle. There is no doubt that the best piano sound comes from the PM40s – that was what they were designed for. For any other acoustic instruments, then these should be miked as closely as is possible without distracting the performers or the audience. I would love to try the Earthworks QTC50’s, which run from 3hz-50kHz (!) but that will need to wait for a while. The whole setup will need some careful thought and experimentation but it has distinct promise, and will enable, uniquely one suspects, as close as is possible a studio quality recording from a live performance venue. More thought is required, but I’m sure I’m on the right track. As a scientist, I’ve always held the view that the simplest approach to a problem is normally the best way to start, and very often, to end. When recording my piano, I’ve tried all sorts of microphones, numbers of microphones, recording stereo, surround sound, ambient pickups, close miking…the list goes on and on. Ultimately, I found, at least to my ears, that the best approach was a single pair of microphones placed just outside the piano – any further in was a bit bassy and any further out sounded too distant. Now I’ve attended concerts and recording sessions with Stuart pianos where it seemed as though the recording engineers (who obviously are very skilled and knowledgeable in what they are doing) literally throw the kitchen sink at the piano so that you can’t see the wood for the microphones, as it were. The results are undeniably impressive, but it left me to ponder the difference in my approach (minimalist) to theirs (maximalist). The PianoMic is specifically designed to record grand pianos, and the philosophy behind the microphone is to show that no other extra microphones are necessary to produce a (very) acceptable recorded sound. My initial recordings with the PM40 began to bear this out, and then I had the opportunity to put this into serious practice. 2.9m and 2.2m pianos on stage. The theatre played host to the Armenian chamber group, the Khachaturian Trio, who performed two concerts featuring not only piano trios, but also some two piano four hand and piano duet works. Wayne Stuart was keen to record the concerts, and so he asked me if I could bring my gear along and help. …yes, I know it’s a cliché, but we did have a rather wet April, and May is getting rather cold. Everything was going quite swimmingly until my right eye decided that anything my left eye could do, it could better, particularly when it comes to retinal detachments. Firstly the vitreous detached itself from the retina, which itself is not that much of a problem, but there is an increased risk of a detachment, and that is what happened two weeks later. Fortunately, I was in the city at the time and a quick trip to the Eye Hospital followed by an equally quick operation by my trusty eye surgeon (thank you yet again…) saved the day, not to mention my eyesight. The eye is now fine, although I will need a slightly revised glasses prescription in about a week’s time once my eye has settled down. On the music front, I have completed the next stage of my piano recording setup, and acquired a professional quality eight channel preamplifier and a 24bit/192khz analogue to digital converter. Allied to the Earthworks PianoMic PM40, the results are truly out of this world. More about that in the next blog entry. I have to put some drops in my eye and rest up a bit. … but what I suspected may happen has happened – Limelight has removed the review of the Leatham Music CD from their website. Interestingly, there are still summaries of the comments made about the review there, but clicking on the review link causes electronic mayhem on their website. So they’ve admitted the review was crap, which of course it was. But the damage has been done – the review was printed in the March edition of Limelight and so people (I imagine many, since Limelight has an Australia-wide distribution and is the official organ, as it were, of ABC Classic FM) now have totally the wrong idea about the recording, the artists, and the piano. The question is, what are Limelight going to do to redress the balance? They have caused significant and unnecessary damage to Leatham Music and they now have a responsibility to correct that. It will be interesting to see what they do. Probably nothing, but one lives in hope. This is my considered review of the CD. “Leatham Music is a small, boutique recording studio based in Albury, NSW. They are dedicated to producing recordings by Australian-based musicians involving the much-admired Stuart & Sons piano. This latest recording by the Melbourne-based duo Igor Machlak and Olga Kharitonova showcases an interesting range of music by Schubert and Brahms on one hand, and Stravinsky and Ravel on the other. The first thing that strikes one on listening is the quality and clarity of the sound. Unlike some other commercial recordings of the Stuart piano, the inherent timbre of the Stuart is faithfully reproduced here and the interplay between the two pianists is able to be clearly heard. The next thing is the quality of the performance. Machlak and Kharitonova have been performing together for quite some time now, and their understanding of each other and their teamwork is quite exemplary. Their technical prowess is self-evident, and it is clear especially in the Brahms that they are thoroughly enjoying what they are doing. The selection of music gives sufficient rein to what one might call the classic repertoire in Schubert and Brahms, and then superimposing the more esoteric and, to the listener, less comfortable works of Ravel and Stravinsky. The overall mix, whilst varied, is ultimately quite satisfying. …but this review by Greg Keane in the Limelight magazine, the monthly guide from the ABC on music, arts and culture, really p! @#$% me off in a big way. It is a ‘review’ of a CD for piano four hands by Igor Machlak and Olga Kharitonova, produced by Leatham Music in Albury on a 2.9m Stuart & Sons grand piano. In case the nutters at Limelight decide to remove this review (they haven’t yet) I’m quoting it in its entirety here, together with the somewhat acerbic but measured response I posted on the website. I don’t think I need to comment any further. “Sensitive and imaginative playing on an Australian Stuart & Sons piano. I was somewhat baffled by this CD. It’s clearly a promotional tool for Stuart & Sons Pianos on the new Leatham Music label, produced by Gregory Lewis and engineered by Trevor Doddridge in All Saints Anglican Church, Albury. Fair enough, but the title, Beauties and Beasts, becomes rather confusing. The inclusion of the four-handed arrangement of Ravel’s Mother Goose Suite is fine, especially since one movement is called Beauty and the Beast. The second two works on the CD hardly reinforce the theme: Schubert’s Waltzes, Op 18A, radiate Biedemeier charm and Gemütlichkeit but are hardly in the same ethereal world as Ravel’s Mother Goose and I can’t for the life of me see anything primitive, let alone bestial, in the selection of Brahms’s Hungarian Dances, which complete the disc. Despite the rather jolly, not to say robust, appearance of the pianists, the playing is sensitive and imaginative, especially in the Ravel and the sound is excellent. …and it certainly makes me think that I should have done something like this quite some time ago. So much so, that I’ve started looking at 24bit recording systems, and I think I may have come up with something that won’t break what’s left of my bank but will still be of professional quality. I have two components of a potential system already (the piano and the microphone) so it makes sense to add the third. And that will be fun. I’ve been experimenting with the position of the PianoMic and have basically come to the conclusion that where it currently sits as shown in the photograph I put up a few days ago is the best position for it. If I bring it closer to the dampers it sounds a bit overpowering in the bass, and further away it is slightly ‘tinnier’ to my ears. Let me state however that anywhere in this piano the microphone sounds good – its just a question of subtle differences which may sound different to different ears. So I’ll leave it there for the time being and see how it goes. So far the stereophonic nature of the PianoMic is coming out well, with the treble notes quite clearly to the right and the bass to the left, as one would expect. When listening to the sounds through my Bose speakers, I find it very difficult to distinguish between that sound and the sound I recorded on the 102-note piano a little while ago. Indeed, the more I listen to it the more I prefer my piano sound – it really does sound like a full concert rather than domestic grand – very warm, full and crystal clear especially in the treble. I’m beginning to feel that I should revisit the CDs I recorded last year. The sound just isn’t up to what I can do now, and that is not the fault of the piano. It just goes to show how important the gear is in the recording process. …struck me as I was listening to the recordings I made over the last couple of days with the PianoMic system. My piano was in tune. Now this may not seem much of an observation to anyone reading this, but the reason I’m mentioning it becomes obvious when the piano hasn’t been tuned or voiced for over just over a year. And the reason for that is not due to laziness or bad organisation or anything like that, but simply because the piano has not needed it. I tested the tuning with my trusty iPhone, and the A440 is exactly that – A440. Quite amazing. Not only that, but there was no sign of any detuning of the unisons – i.e. each string was still precisely in tune from the last time it was tuned. Additionally, the tone of the piano is still exemplary and there is no need to re-voice the piano in any way – it still plays just as well as it did a year ago. Now I don’t wish to blow trumpets unnecessarily, but I really would like to see any other piano brand with the same stability of tuning. My piano gets played constantly, either by me or my students so there is no validity in the ‘leave it alone and it will stay in tune’ excuse. This piano is simply amazingly stable in terms of tuning, action and voicing. …and finally acquired a top-quality piano microphone for the Stuart piano. Whilst I have done a number of recordings both at home and at the Stuart & Sons factory, and the results were, considering the equipment I was using, quite good, there seemed to be something missing – something that prevented me from being satisfied with the outcome from a sound point of view, no matter how well I though I played. The main issues were not so much the quality of the microphones I was using, which despite their relative inexpensiveness were nonetheless quite reasonable, but also the placement of the microphones and the acoustics of the room(s) I was recording in. My music room at home is in fact quite small, and the acoustic is ‘dry’ – i.e. not very much reverberation. On the other hand, the ‘White Room’ at the factory has very good acoustics with a satisfactory but not overwhelming reverberation – making it very good from a pure acoustic performance viewpoint. And this is where the placement of the microphones is critical because the sound close to (or even inside) the piano is different to that in the wider acoustic in the room. Too often too many microphones are used and that runs into problems in the mixing phase since one is never sure of the actual sound one wants to get. The sound that the pianist experiences is the one that he/she uses as part of the performance feedback loop I’ve spoken about before, and that sound is ideally the one that should be captured. Try as I might, I’ve never been able to capture that sound, and even professionals with exorbitantly expensive equipment don’t seem to be able to catch it either. That is not to say they get a bad sound – far from it – but it is always not close enough to the actual sound to my ears. Then of course one has post production, equalisers, limiters, phase analysis etc etc ad nauseum and when one hears the final result quite often the essential sound of the Stuart piano has been compromised. In my view, most professionally produced recordings of the Stuart piano are compromised in this way. What I wanted was something that captured the essence of the Stuart and required no post production fiddling whatsoever – just a simple stereo mix and that’s it. And now I think I’ve found it. The Earthworks PianoMic system. I’ve used this before at the factory, and have been very impressed with the results. It has a range of 9hz – 40kHz, significantly greater than the standard 20hz – 20kHz of the microphones I’ve using to this point. And, most importantly, it sits right inside the piano. The two tiny but extraordinarily effective random incidence pickup microphones sit about three inches above the dampers, and capture as close as anything I have seen or heard at this point the actual piano sound. I’ve done a number of test recordings using my Boss BR-1600 (recording at 16bit/44.1kHz, CD quality) and the results are quite amazing. There is a presence and depth to the sound that is missing from just about everything I’ve done to this point in time. I suppose it serves me right, to an extent. After having acquired a superior quality piano and recording with less than superior quality microphones, it is not surprising that the results did not really match what I wanted to achieve. I don’t have that excuse anymore. Now all I need is 24bit/96kHz recording. The Oxford Dictionary defines music as follows: “vocal or instrumental sounds (or both) combined in such a way as to produce beauty of form, harmony, and expression of emotion”. The interesting aspect of this to me is that music ‘produces’ effects which are very much subjective and unique to the person either producing or listening to music. Music, at the level we understand it, is very much a human experience – no humans, no music. When it comes to pianos, given the number of people in this world and the number of people playing, it is clear that a large number of pianos are needed to fill the available demand. At the lower end of the price spectrum, countries such as China are ramping up to churn out pianos at an ever increasing rate. This is obviously not a bad thing, but it does imply that each instrument is basically the same as any other, and will play and sound very much in the same way. Add into this the plethora of electronic keyboards now being produced, and that sameness and standardisation is very much a feature of that level of instrument. But the piano since its inception has never been static, especially for the 200 years following Christofori’s pianeering(sic) work. More keys, stronger frames, more sustain, more volume – the list goes on and I don’t have to expound on that here. At the top end of the piano spectrum, the situation is anything but innovative. The Steinway ‘standard’ has been present for well over 100 years and virtually every manufacturer slavishly follows this design. Whilst it is true that each manufacturer is ‘different’, the differences between pianos are subtle and very minor. A vast majority of people (myself included) would not be able to distinguish between say a Steinway and Bosenyamaha sound in a blind test. Then along comes Stuart & Sons and immediately in many peoples’ eyes the excrement hits the thing on the ceiling that goes round and round. It’s not the same as X, therefore it’s no good. The tone is different, it’s got four pedals and so on and so forth. Yet many of these doomsayers also decry the lack of innovation in pianos. In the last post I mentioned comments by Geoffrey Lancaster about Stuart pianos. He wants innovation but, “They don't have that dimension of warmth that, say, a great Steinway or a great Bosendorfer has”. Innovation changes the instrument and produces a different quality of sound and feel. If it doesn't change the instrument, what is the point? Steinway and Bosendorfer do not innovate because that would change their ‘standard’ and people will rise up and desert concert halls in droves. They are stuck in a rut of their own making. They have established the status quo. They dare not innovate because that status quo, and their comfortable position in today’s music world and marketplace, would be destroyed. Lancaster totally misses the point. He is all for ‘innovation’ but doesn’t like the changes that innovation brings. He is stuck in an 18th and 19th century rut, and no amount of coaxing will bring him and others of his ilk into the 20th let alone the 21st century. He plays great Mozart and Haydn in a 250 year old way. Put him on a Stuart piano, and he would be totally lost. And that’s a pity, because with the right feel, attitude and skill, any classical composer can be given a new, valid life on these pianos. Many people support innovation and change in principle, but in practice, that’s a totally different matter. Very few can handle it. … a five minute radio broadcast on National Public Radio in the USA - http://www.npr.org/2011/01/18/132945634/musical-innovation-a-grander-grand-piano. It was a shame that due to time constraints (5 min 37 sec to be precise) it was rather difficult to present the full story in anything more than a general approach rather than specific details, but nonetheless Neva Grant did a good job under the circumstances and I suspect it has whetted the appetite for more interviews down the line. I found that the quality of the sound was not good. In particular the sound from the upper notes was as though someone had hit a piece of metal with a hammer – it was clear that the microphones and recording equipment used were not of sufficient quality to give an accurate view of the real sound. Stuart & Sons have produced a much better sound clip which will be included in the NPR website, and a link to it is provided here - http://www.mediafire.com/?ney62sr2ynxdiyx. This clip not only showcases the treble notes, but also the extra bass notes and provides a real sense of both delicacy and power where required. The second issue I had was the comments by the Australian pianist Geoffrey Lancaster. Lancaster is a world class musician no doubt, but his expertise is in historically accurate performances – he has done some great work on the fortepiano and with the Tasmanian Symphony Orchestra. But he is not known as a ‘concert pianist’ per se, and his experience in playing Stuart pianos is very, very limited, so his comments really have no basis. For example, "I find the sounds very cold," Lancaster says. "They don't have that dimension of warmth that, say, a great Steinway or a great Bosendorfer has. It's this clarity — this so-called clarity or crystalline quality, it's really quite icy." That’s a shame, because I and many others have found the sound to be anything but “icy”. The Stuart has the greatest tonal and dynamic range of any piano, and the sound that is produced is very much up to the pianist’s skill and knowledge of the instrument. The so-called “dimension of warmth” is a pseudonym for murkiness of sound – the Stuart sound is crystal clear by comparison. I would question how he would reconcile playing Mozart and Haydn on a fortepiano with playing the same music on a Steinway or Yamaha. He does make a valid point about innovation – “So I'm all for innovation in the modern piano. To me, the piano is a pinnacle of human achievement. So it seems right and proper that it should continue to develop." It’s a pity that he is not able to reconcile that view with the flexibility that the Stuart allows in performance. Mozart is ethereal on the Stuart. My YouTube channel http://www.youtube.com/user/DrChristopherMoore is going well, with four pieces up already and more to come when I get the chance to do some more recording, both here at home and at the factory. Despite virtually no publicity other than on this blog, after two days I’m up to 50 views on the Zhiganov and 35 on the GRK. No bad going for a totally unknown visually impaired (!) and at my age, mentally impaired pianist. I’m having fun – and the challenge of doing video recordings (no room for error) is pushing me very hard. I suspect it’s something I need, and is long overdue. … I was able to recover from what was really a rather quiet Christmas this year (which shows that I must be getting less resilient to such things in my old age) to get back to my musical activities once again and sit in front of a piano, an oboe and cor anglais with a reasonably serious expression on my face and a quiet new year's resolution inspired determination to make more progress in the many musical areas that I now find myself involved in. In particular, I was able to find a day where I could travel to Newcastle and visit the factory to do some recording on the ‘Ultimate’ 102note 2.9m grand piano. Despite the fact that the factory is theoretically on holidays, that doesn’t stop the necessity of the Stuarts being in the factory each day to deal with multitudinous emails and visitations etc, and of course nosy owners of Stuart pianos who want to come up and waste everyone’s time and patience recording esoteric music played in a not too convincing manner and hoping very much not to make any mistakes since this time a video recording is also being made, in high definition yet (trans: you can see all the wrinkles much more clearly). As usual, I had a great time, talking about many other things other than pianos, but I was able to spend several hours doing my best to get everything right and by the time I have finished I had four reasonable recordings in the can, including a Pastorale by Georgy Rimsky-Korsakov (No, not Nicolai, but a grandson of same) which is very effective on the Stuart. I had already recorded this at home and the results soundwise were very good, but I was anxious to try it out in the ‘White Room’ at the factory where I thought the acoustics would be better suited to the piece, and in fact this turned out to be the case. 3)	the amazing power and sustain throughout the range which gives rise to some quite unusual tonal effects throughout the piece. I used two microphone setups to record. The first was two Rode NT3 microphones which I have had for a while now and give very sensitive and good sound across the range, coupled with a Rode shotgun microphone placed in the main body of the room to capture more of the ambient sound. The second was an Earthworks PianoMic system, which actually sits right inside the piano but nonetheless puts out quite a superb sound. The mix is untouched with no equalisation or limiting, and the result is quite spectacular with both microphone types. I must be improving, because it only took me two takes to get a good video recording which just about every note close to the way I wanted it. It is never easy to play anything on the Stuart because as I have said before it amplifies everything I do even slightly wrong, but this time I did what I thought was a reasonable job by my standards. So rather than simply put out the audio files as I have done in the past, I have now created a YouTube channel for the ‘Ultimate Piano’, here, and have placed this video which can be viewed in up to 720p resolution (that’s 1280x720). I did record at 1080p but I think the file sizes are too big and I can’t see the advantage at this stage. So I will add to this as I go along, not just videos but also straight audio as well. The aim is to build up a series of performances which will showcase the piano (at least at my level of performance), and it will show (hopefully!) that mere mortals like myself can get a huge amount out of these pianos. … and as usual things are not entirely what I would call organised. I was unable to do two things over the last week or so, the first being the talk at the Powerhouse Museum that I mentioned in my last post, the reason being that they had too many things planned as part of the programme and they decided my five minutes of spiel wasn’t required, which was not a problem for me since I had a couple of other things to do at the time connected, with getting all of the music ready for Midnight Mass this year – given the mass plus 30 minutes of communal carol singing beforehand that is actually quite a deal of music to prepare. The second was that I was unable to fit in a visit to the Stuart & Sons factory both to do some more recordings of a couple of pieces I’ve been playing and also to celebrate, if that is the correct word to use under the circumstances, the fifth anniversary of the delivery of the piano, which occurred on December 12th, 2005. It seems such a short time, looking back on it, but I still feel that I have learnt a great deal more in musical terms than I would have done if I hadn’t got it, or else had acquired what I might call a ‘standard’ piano (in the design sense), no matter what quality. I’m going to have to try to schedule a time sometime in the new year, allowing for the fact that the factory closes down over the Christmas / New Year period to give the staff a much needed break from the exactitudes of constructing pianos of the quality that Stuart & Sons is renowned for. In the meantime, my oboe is away being serviced, the cor anglais is sounding good and of course the piano is still responding to my clumsiness in as forgiving a way as it can. Happy Christmas and a prosperous and musical New Year to all. Considering as I said before that it is now almost five years since I acquired my piano I have been thinking about the changes in my playing and attitudes over that time and in particular how I now tackle various pieces of music and, importantly, the music that I play. I’ve always been interested in unusual and rare classical music and have quite an extensive collection now of quite esoteric but nonetheless extraordinary music courtesy, in particular, to sites like www.pianophilia.com. What this has done has sharpened my awareness of sounds and feel on the piano, and the unique characteristics of the Stuart piano have really become much clearer and much, much more logical as I have progressed. So much so, that I am finding it very difficult to consider how I would play other pianos, even though I still do, and appreciate their qualities. I have also started going back to some of the more ‘standard’ classical repertoire, and found that for some strange reason I seem to be playing these better, in the sense that my fingers seem to be much more fluent than they’ve been for many a year, and the sounds that are coming back to my ears are much clearer and more precise than I can remember for quite some time. However, Stuart & Sons were existence for some years before I arrived on the scene, and indeed the development of the Stuart piano has been a very long term project not only from Wayne Stuart’s perspective (piano design has been his life for more years than I suspect he cares to remember) but also for many other organisations who have helped along the way. I don’t intend to go into great detail here, but a couple of thoughts may be relevant. Stuart pianos #1 and #2 are still housed (and played) at the Newcastle Conservatorium, which was the first organisation to commit to the Stuart ethos and paradigm, and #3 is at the University of NSW. Indeed, without organisational support of this type it is doubtful whether commercial production of Stuart pianos would have been possible, since the amount of capital and developmental work required would have prohibitive for any profit-minded enterprise to consider. Stuart pianos are now housed at many of the major musical establishments in Australia, and their use has contributed enormously to the status of these pianos as now exists. Stuart piano #4, which was built around 1999, is now housed at the Powerhouse Museum in Sydney, where it is used quite frequently for recitals of many kinds, and this blog entry was triggered in the main by the fact that I have been asked to give an introductory talk on Stuart pianos at a function there next week which, amongst other things, features a recital by the well known jazz musician Kevin Hunt, who is the current recipient of a Piano Australia scholarship at the Sydney Conservatorium focussing on performance characteristics of Stuart pianos. I’m not sure exactly what I will be saying, but it has been suggested that I look at the links between public support of human endeavour through our institutions, its long term and far reaching implications for the development of Australian society and its cultural mores, with particular reference of course to the Stuart piano. It’s not an area that I have really thought much about, to be truthful I’m just a (very) simple scientist with a modicum of musical ability (or maybe vice versa), but there is no doubt that a small operation such as Stuart & Sons does not exist in isolation to the society in which we live, and it is critical that that society is an integral part of and must understand and accept any cultural development of the type which Stuart has triggered. There are many boutique piano manufacturers in the world, each which their own particular claim to fame. But Stuart & Sons is unique in being a start-up concern which has designed and built pianos from scratch – for example, major components such as the case and the frame are not imported from other established manufacturers but made here. I think the only other critical parts which are not made here are the piano action and the piano string wire. I’ve heard it said that all pianos are variations on the same theme. A piano is a piano, obviously, but whilst all other grand pianos built today are variations on the same ~120 or so year old Steinway theme, the Stuart is a completely new theme and has to be treated as such. The old ways are no more. The piano is dead. Long live the piano. …when I forsook my classical roots as a pianist and joined David and some of his friends in our annual event helping to raise a (hopefully) considerable amount of money for homeless and orphan children in Vietnam. $20,000 is quite a considerable amount of money in anyone’s language, and from what I’ve seen will make quite a difference to some people’s lives in Vietnam. The evening was very successful, and despite any misgivings I may have had our music went off very well, and I was (somewhat fatherly, I must admit) very pleased with the way David (and his friends, of course) played. Of particular note were the two brothers of two of my piano students, one who is a superb classical and jazz acoustic guitarist, and the other (only 12 years old) a very good percussionist already. Great stuff all round and unusually for a ‘background band’ (we were playing as the guests arrived) we got good rounds of applause after each number. Now I have a bit more time on my hands to do my ‘normal’ music, the Stuart and ancillary instruments will take centre stage again. I did have a chance to record a piano track for a colleague who wanted to sing this hymn at a memorial mass next week, and I have to admit the recording sound came out very well, with the bass and treble notes very clear and resonant. It does seem that I have the optimum conditions for recording now in my little music room and like all aficionados of Ockham’s razor it turns out, as I have commented before, that the simplest arrangement is the best. I am now using a pair of Rode NT-3 microphones and these are quite brilliant, very sensitive (I use them as choir microphones) and with a great dynamic range.